410 Beacon is located on the north side of Beacon, between Gloucester and Hereford, with 408 Beacon to the east and 412 Beacon to the west. 410 Beacon was designed by Cabot and Chandler, architects, and built in 1886-1887 by Charles A. Dodge, mason, for Isaac Tucker Burr, Jr., a banker and broker, and his wife, Alice McClure (Peters) Burr. He is shown as the owner on the original building permit application, dated November 11, 1886. 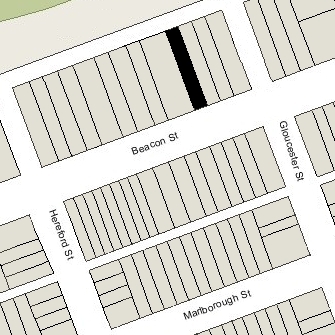 Isaac Tucker Burr, Jr., purchased the land for 410 Beacon on October 14, 1886, from George Higginson, part of a 330 foot parcel he had purchased on January 14, 1884, from the Boston and Roxbury Mill Corporation. Click here for an index to the deeds for 410 Beacon. On January 18, 1887, Charles Head purchased a 50 foot wide lot at 412 Beacon from George Higginson, on which he proposed to build his home. To protect their river views to the west, on February 23, 1887, Isaac Tucker Burr, Jr., and Dr. Richard Manning Hodges, owner of 408 Beacon, purchased the lot at 414 Beacon from George Higginson, and on April 30, 1887, they entered into an agreement with Charles Head by which he agreed to limit the depth of his house to no more 83 feet 6 inches from the northern line of Beacon, and they agreed to limit the depth of any house built at 414 Beacon to no more than the depth of the house built at 412 Beacon. This agreement both assured that the house at 412 Beacon would not impede the views from 408 and 410 Beacon and that 412 Beacon’s view would not be impeded by any future house built at 414 Beacon. By the 1887-1888 winter season, Isaac and Alice Burr had made 410 Beacon their home. They previously had lived at 377 Marlborough. They continued to live at 410 Beacon during the 1891-1892 winter season, after which they moved to Milton. On June 8, 1892, 410 Beacon was purchased from Isaac Tucker Burr, Jr., by wholesale dry goods merchant Rufus Frost Greeley. He and his wife, Ellen Amelia (Frost) Greeley, made it their home. They had lived at the Hotel Vendôme during the previous season, and before that in Chelsea. On June 12, 1894, Rufus Greeley transferred the property into his wife’s name. The Greeleys’ three children lived with them: Marion Greeley, Norman Frost Greeley, and Russell Hubbard Greeley. Norman Frost Greeley, a wholesale dry goods merchant in his father’s firm, married in January of 1898 to Grace Helen Grandin. After their marriage, they lived at 461 Commonwealth with her parents, John Livingston Grandin and Grace Helen (Crockett) Grandin. Rufus Greeley died in May of 1904. Ellen Greeley continued to live at 410 Beacon with their unmarried children during the 1905-1906 winter season. In 1906, Ellen Greeley and Marion Greeley moved to the Hotel Victoria at 273 Dartmouth, and Russell Greeley moved to Paris. Ellen Greeley continued to own 410 Beacon and lease it to others. The house was not listed in the 1907 Blue Book. By the 1907-1908 winter season, 410 Beacon was the home of Albert Ivins Croll, a yarn dealer, and his wife, Sarah Helen Merrill (Knowles) Croll. They had lived at 183 Marlborough during the 1905-1906 season. They also maintained a home in Manchester. They continued to live at 410 Beacon during the 1909-1910 season, but moved thereafter to an apartment in The Cambridge at 485 Beacon. 410 Beacon was not listed in the 1911 Blue Book. During the 1911-1912 winter season, 410 Beacon was the home of Dr. Hugh Kerr Hatfield, a physician and orthodontist, and his wife, Eliza Salmond (Sylvester) Harraden Hatfield. They had married in August of 1910. Prior to their marriage, he had lived in Brookline with his parents, George Kirby Hatfield and Mary (Kerr) Hatfield, and before that at 129 Marlborough, where he continued to maintain his office. They also maintained a home in Hanover, where Eliza Hatfield had been born and raised. The Hatfields had moved from 410 Beacon by the 1912-1913 season, and by the next season were living at 362 Marlborough. By the 1912-1913 winter season, 410 Beacon was the home of Dr. George Arthur Waterman and his wife, Claire Norton (Forrest) Waterman. They had married in June of 1912 and 410 Beacon probably was their first home together. Prior to their marriage, he had lived at 395 Marlborough with his brother-in-law and sister, Frank and Alice (Waterman) Thayer. George Waterman was a physician and instructor in neurology at Harvard Medical School. He also maintained his medical office at 410 Beacon. His brother, William Edgard Waterman, president of the Waitt & Bond cigar manufacturing company, lived with them at 410 Beacon. He also had lived at 395 Marlborough in 1912. He continued to live at 410 Beacon during the 1915-1916 season, but moved thereafter to the Hotel Puritan at 390 Commonwealth. Ellen Greeley died in November of 1917. 410 Beacon was inherited by Marion, Norman, and Russell Greeley, who continued to lease it to others. 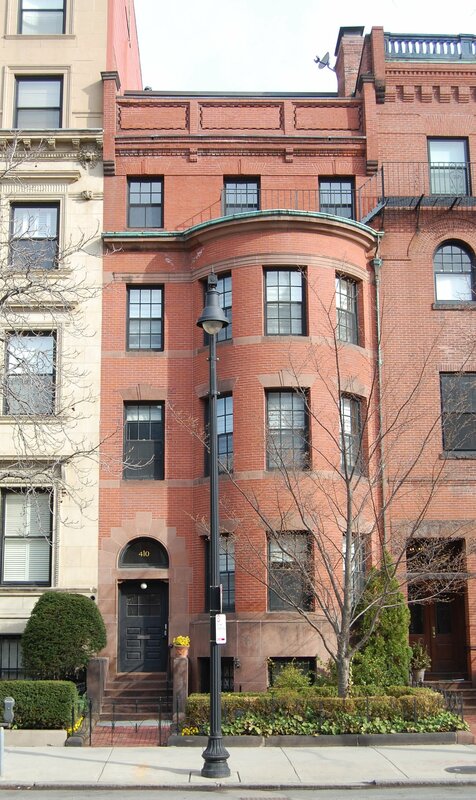 George and Claire Waterman continued to live at 410 Beacon in during the 1918-1919 winter season, after which they moved to The Charlesgate at 535 Beacon. By the 1919-1920 winter season, Norman and Grace (Grandin) Greeley had made 410 Beacon their home. They previously had lived at The Kenmore at 496 Commonwealth. They continued to live at 410 Beacon in 1923, but had moved to 68 Beacon by 1924. 310 Beacon was not listed in the 1924 Blue Book. By the 1924-1925 winter season, 410 Beacon was the home of Joseph D. Des Marais, a hair dresser, and his wife, Marie (de L’Etoile) Des Marais. They continued to live there during the 1925-1926 season, but moved thereafter to an apartment at 423 Marlborough. On April 26, 1926, 410 Beacon was purchased from Marion, Norman, and Russell Greeley by Charles Edward Cotting, Jr., who (according to an April 27, 1926, Boston Globe article) planned to occupy the house in the early fall “after extensive alterations.” At the time of the purchase, he lived at 404 Marlborough with his mother, Ruth Stetson (Thompson) Cotting, the widow of Charles Edward Cotting. Charles Cotting was an investment banker, a partner in the firm of Lee, Higginson and Company. In 1922, he had purchased land in Berlin, Massachusetts, where he founded the Chedco Farm, where he established one of the first Guernsey cattle herds in America. He purchased 410 Beacon in anticipation of his upcoming marriage in June of 1926 to former stage and silent film actress Constance Binney. 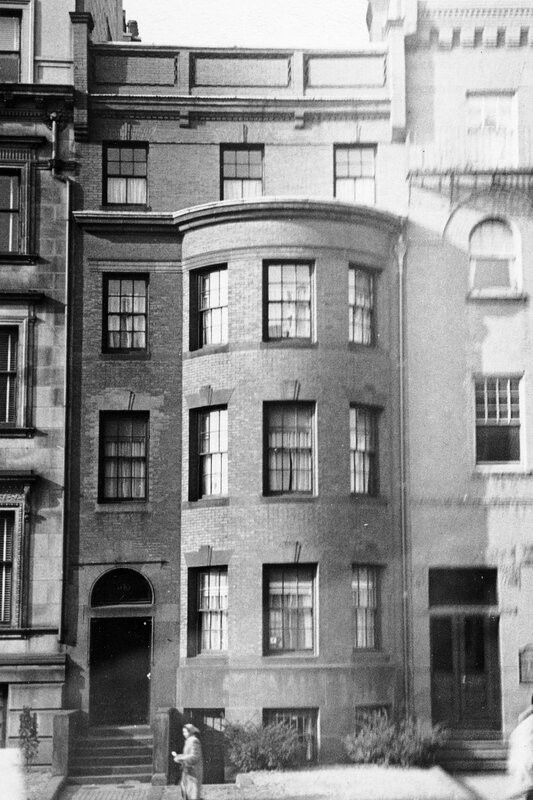 After their marriage, they made 410 Beacon their Boston home and also maintained a home in Manchester. On July 27, 1931, Charles Cotting transferred 410 Beacon into his wife’s name. On June 1, 1932, Constance Cotting transferred 410 Beacon to a trust for the benefit of Charles Cotting. They were divorced in July of that year. She married again in September of 1932 to Henry Wharton, Jr.
Charles Cotting continued to live at 410 Beacon and remarried in July of 1939 to Sarah H. Winslow. After their marriage, they lived at 410 Beacon and in Manchester. Charles Cotting died in October of 1985 and Sarah Cotting died in August of 1992. On September 7, 1993, 410 Beacon was purchased from the Charles E. Cotting Trust by Robert Melancton Metcalfe, co-inventor of ethernet computer networking technology and an information technology entrepreneur, as trustee of the Metcalfe Realty Trust. In May of 1994, he applied for (and subsequently received) permission to renovate the house, including adding a penthouse. He and his wife, Robyn (Shotwell) Metcalfe, an author, made it their home. On February 28, 2008, he transferred the property into his and his wife’s names. The property subsequently changed hands. It remained a single-family dwelling in 2017.